An old time favorite dress, the pink gingham print is for those beautiful days. 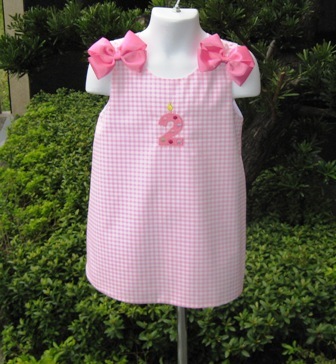 This little dress is so cute with a pink gingham print and monogram with a candle number (0-9)...This cute dress is accented with 2 hot pink bows..
All my creations have been sewn with love and detail in my pet and smoke free home. ALL CUSTOM ORDERS WILL BE MADE AFTER PAYMENT AND INFORMATION GIVEN.